Whether straight or curved, your interior staircases must have rails to make them safe to use. The standard codes provide information on rail heights and the proper distance between the wall and the rail. Measure railing height from the bottom of the ground at each step to the top of where the handrail will be located. U.S. codes require railings against a wall to be between 30 inches and 38 inches high, while handrails on open stairs must be 34 to 38 inches high. To ensure your hand has enough room to slide down the rail, the rail must be at least 1.5 inches from the wall. 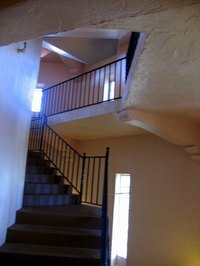 The railing can project into the stairway up to 4.5 inches. This means a handrail against your stairway wall must be narrow, no larger than 3 inches in diameter. Your handrails should be a continuous line that your hand can slide down without interruption with one exception: the standard codes allow stair railings to be interrupted at newell posts. However, there may be no open breaks or spaces down the staircase. What Is Typical Wrought Iron Rail Spacing?